If you have been hearing about servant leadership for a while but still don’t feel like you have grasped the full concept, this list can help you get started. These resources can help leaders decide whether to take the proverbial road less traveled: that oxymoronic journey to become a servant. Servant Leadership: the Best-Kept Secret behind Successful Customer Experiences, by Karen Smith-Will - People sometimes still refer to dated models referring to organizations as providing products or services. But don’t be confused: every organization is a service organization. 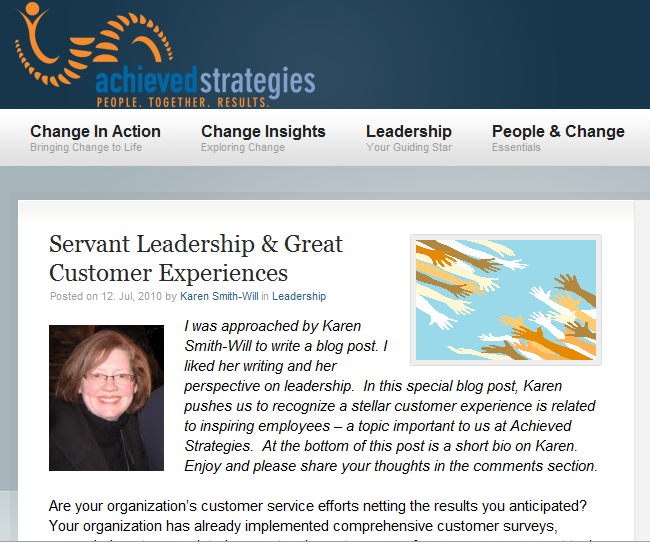 I wrote this guest-blog for AchievedStrategies.com to describe how the servant leadership model can better align your organization to deliver quality services your customers deserve. A day before leaving for Albuquerque to present at OBTC, I had the last-minute opportunity to spend a morning with my son at his elementary school. After an awards ceremony, we all went outside with the kids to play games. As I watched them play, I spoke to another parent, a pastor of a local church. He was detailing some church models and ministries he had observed recently, when I felt a painful sensation. 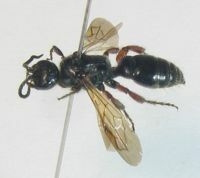 “I think something stung me,” I interrupted, pressing my palm into the top of my thigh, covered by blue jeans. Networking has been a fabulous asset during the past few months since I left a Fortune 200 company. As friends had predicted, many people are inherently wired with a “help” gene and will liberally offer up business leads, ideas, suggestions, or names of other contacts. The more transparent I am with my needs, the more likely people can--and often will--help. Some of my networking friends are competitors, and that's great. As long as we are straight up, we can both learn together and collaborate to improve our consulting field--a win-win proposition.